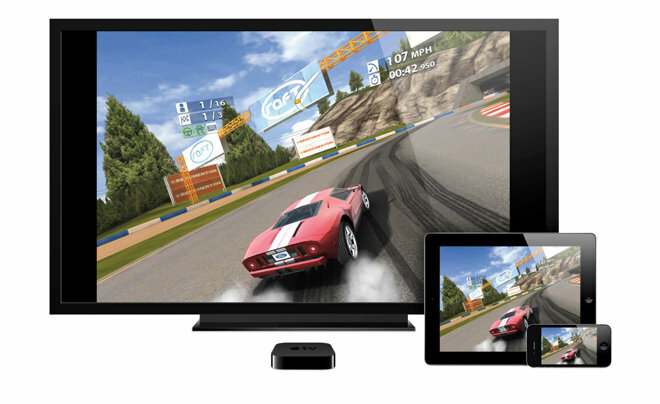 Though the new Apple TV isn't expected to have a streaming subscription service available at launch, that's not a problem for investment firm J.P. Morgan, who believes the device's real selling point will be an App Store with traditional console-style videogames. To analyst Rod Hall, the massive $34 billion console gaming market is where the "real opportunity" for a new Apple TV lies. He estimates that an anticipated set-top box with a dedicated App Store would give Apple a foothold in that market and contribute a meaningful amount to its bottom line. Hall's self-described conservative estimates suggest that every 5 percent of the gaming market Apple can capture will add about 2 percent to the company's annual earnings per share. Compare that to a streaming TV service, which he believes will not be greatly profitable due to terms with content owners. His estimates suggest that a $40-per-month subscription plan would add just 1.4 percent to Apple's calendar year 2016 earnings per share. The projections were detailed in a note to investors issued on Monday, a copy of which was provided to AppleInsider. The real key for Apple's anticipated entrance into the console gaming market is the A8 chip, which features PowerVR graphics that are estimated to be about on par with a Sony PlayStation 3. The power could be even greater if Apple decides to go with an anticipated "A9" processor, Hall noted. The analyst also said that Bluetooth input should allow a new Apple TV to connect with gaming controllers that are already available for iOS. With titles available for download on the App Store, users would be able to game comfortably from their couch on their HDTV, competing with the likes of Microsoft's Xbox One. J.P. Morgan has maintained its "overweight" rating for shares of AAPL with a price target of $145.